Even in the present age of digital retail, the physical showroom is the center of activity for auto dealerships. Customers today are comfortable with technology, and conduct most of their auto research online. Instead of fighting these trends, it's time for auto dealerships to embrace them, using the accessibility of digital technology and power of touchcscreen devices to engage customers and support the car buying process. 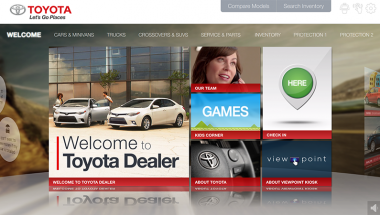 ViewPoint improves the car sales process, giving both salespeople and consumers a valuable interaction tool. Everything from research to customization becomes easier with these devices, and whether consumers use them alone or in collaboration with sales associates, they provide a positive and compelling experience. A great deal of customer research today takes place at home, using online resources. It's important for physical dealerships to provide a continuation of this experience, with informative digital content presented in a way that will reassure buyers before they finalize the sale. Promote the dealership: Dealerships can use ViewPoint to provide a thoughtful, sincere and informative explanation of why the customer should purchase at their dealership. Salespeople can use the kiosk to kick off the sales process with a “Why Buy Here” presentation, setting the stage for a collaborative sales process. Seamless transition from researching and shopping online to the showroom: Dealerships can use the same assets for websites and kiosks, offering consistent and high-quality information that customers will trust. High-quality, consistent sales presentations: These selling tools are built on detailed, up-to-date information and compelling visual content. Easy access to information: Product and pricing information displayed prominently in your showroom inspires trust and fosters collaboration. Customers want to feel they are getting the whole story. Updated inventory visibility: An accurate view of which new and pre-owned vehicles are on the lot circumvents two equally negative situations - users setting their hearts on cars that are not available and consumers not being able to find a good match that is actually there. Consumers still trying to determine exactly what vehicle suits their needs can take advantage of kiosks to find the perfect match. By listing all available options in several categories and helping shoppers measure their pros and cons, these devices get users ready to buy. Support independent shoppers: Kiosks accommodate customers who want to gather information on their own. This habit has been fostered through easy access to information online, and can extend to the showroom. Draw attention from across the room: Eye-catching HD video and high-resolution images draw potential customers in, encouraging them to get a more in-depth view of the product line. Simple browsing: A kiosk's beautiful interface makes it easy to find detailed product information, from makes and models to accessory combinations and standard features. Enable the decision-making process: Build-a-car options, inventory access and search capabilities help customers find their next car. No matter what stage of the buying process consumers are in, there is a resource that holds relevant information. Kiosks provide a way to engage customers who are very self-directed, providing a user-friendly window into the brand's information that shoppers can use on their own. If a showroom is very crowded, kiosks provide a way for waiting customers to learn about the available vehicles. Take advantage of customer comfort with technology: Touchscreens are easy to use and are immediately familiar, and the best software for these devices presents a lag-free experience that will keep users from getting discouraged. Collaborative or self-guided: These compelling kiosks can keep consumers interested until staff members become free, or even serve as the main point of contact if these shoppers would prefer to direct their own experiences. If customers are undecided, salespeople can guide them through the possibilities on a screen big enough for both parties to use comfortably.